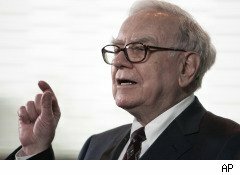 Warren Buffett's Berkshire Hathaway (BRK-A) was questioned earlier in the year by U.S. regulators on why the holding company didn't write down $1.86 billion in losses largely from its investments in Kraft Foods Inc. (KFT) and U.S. Bancorp (USB) during the second quarter, Reuters reported. In a May letter to the Securities and Exchange Commission, Berkshire CFO Marc Hamburg said earnings potential and the resulting stock appreciation for both companies would render such losses temporary and therefore didn't warrant a write-down, the wire service said, citing documents Berkshire filed with the regulator Monday. Berkshire bought shares of those companies in 2006 and 2007. Hamburg said the company expected to recover its losses from its positions in Kraft and U.S. Bancorp within two years, Reuters said. Both companies' share prices increased at least 10% during the first quarter, Reuters said, citing the letter from Hamburg. The SEC questioned Berkshire's decision to not write-down the value of those investments because the company had made the investments more than a year prior to recording its second-quarter results, the wire service said. The Berkshire documents didn't say how the issue was resolved, and representatives for Buffett didn't immediately respond to a request for comment, according to Reuters.